Enjoy the invigorating feeling when your circulation gets into its stride as you tread water. Your metabolism will be gently stimulated and your immune system strengthened. You do not have to do anything else – simply take time out for yourself. Wise men heal that which is not yet ill. The Kneipp philosophy is aimed mainly at preventive application but is also suitable in dealing with the treatment of existing illnesses (curative). The Kneipp approach regards itself as being supplementary and never as contrast to scientific medicine. Hydrotherapy. Treading water and Kneipp effusions strengthen the body’s defences, improve circulation and heighten performance. At the Sonnenhof you can undergo a Kneipp cure in an exclusive atmosphere with the support of an excellently trained Kneipp bath attendant. Exercise. With sporting activity the cardiovascular system really gets into gear. Exclusive cycles are available for you on loan. Or you can discover the barefoot path in the spa park directly opposite the hotel. In the fitness rooms our therapists will assist you with strengthening courses and workouts. Nutrition. What the priest, Sebastian Kneipp, taught in the past is today more up to date than ever before: in our restaurants you will find healthy wholefood which helps to prevent illnesses. Phytotherapy. When conventional medicine reaches its limits, medicinal herbs can provide effective relief. In teas, ointments or bath additives, the holistic medicine unfolds its full effect. Balance. A conscious, balanced way of life brings body, spirit and soul into harmony. Moderation is also part of the philosophy as is also things such as helpfulness and responsibility in dealing with nature. 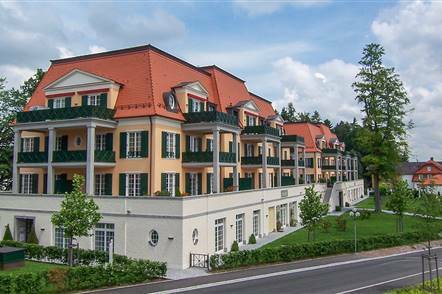 The Steigenberger Hotel Der Sonnenhof offers the perfect prerequisites for implementing the 5 pillars of the doctrine of Kneipp. The best way of getting to know this is to take up our offer during a Kneipp trial week. Following an initial examination by a medical specialist we will draw up your particular individual Kneipp cure. The medically prescribed Kneipp applications, two partial massages, daily water gymnastics together with a gymnastic and sports program (excepting Sundays) and the final discussion are all contained in the package for the Kneipp Trial Week. Ideal for getting acquainted with our offer in Kneippism. You can book the Kneipp Trial Week by telephone at: 08247 / 959-0.